What Does a “State of Emergency” Mean? In preparation for Hurricane Florence, Governor Larry Hogan has asked State agencies to launch a coordinated effort to keep Marylanders safe and informed in the upcoming days. Governor Hogan signed an Executive Order declaring a state of emergency in Maryland on Monday, September 10, 2018 at 3:30 p.m. Here is information on what a state of emergency means. Allow extra time to get to your destinations. This entry was posted on September 12, 2018 at 7:58 am and is filed under All News, Anne Arundel News, Calvert News, Charles News, Community, County, More News, Prince George's News, St. Mary's News, z 600X120 Top Ad Bottom, z 600X120 Top Ad Top. You can follow any responses to this entry through the RSS 2.0 feed. 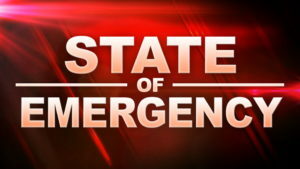 5 Responses to What Does a “State of Emergency” Mean? Maryland should always be in a state of emergency. Stay safe! Remember… turn around, do not drown! Looks like we have a lot of rain coming our way. Some areas in the State of Maryland, are constantly in a “State of Emergency”, Charles County for one. When a tornado hit LaPlata, there was one neighborhood that was particularly ravaged and the police had it blocked off. Only those who lived there could go there. Good question: were there police cards, not assigned to the area, not doing their official duty, using their police position for personal gain to see what the neighborhood looked like? Probably. Access that Jane and John Doe don’t have. What the police do in their police vehicles is not questioned nearly often enough. There is a serious lack of accountability in the criminal justice system.